Jimbo Dibblenip was a strange man indeed, different from all the other men in the village. While they worked hard as farmers, blacksmiths, and grocers, Jimbo Dibblenip stayed home and held his bag. All the villagers wondered what Jimbo kept in the bag, but nobody ever was invited to his house, so they didn't know. Frederick came up with a brilliant idea. He ran to his burrow and picked up his basket. 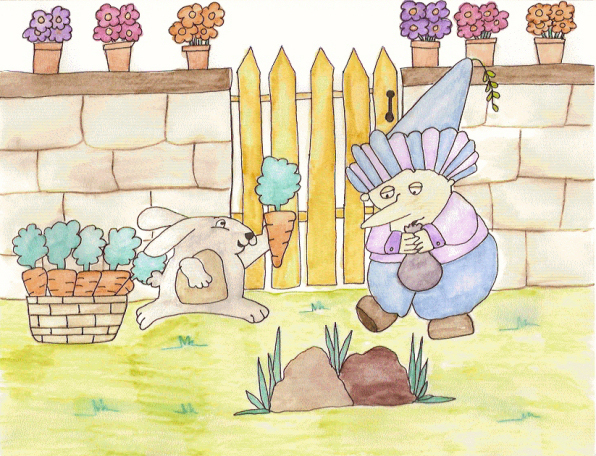 He headed straight for Dalbert Jones's garden and picked ten of the biggest carrots, putting them in his basket. Even though it was heavy, he carried it over to Jimbo Dibblenip's house. Jimbo mumbled a few words and hugged his bag closer. Frederick Hopperlum grew excited with anticipation. “I promise I won't take them from you, whatever they are. “I'm not going to give you these delicious carrots just to see a bunch of rocks.” Frederick put the carrots back in the basket and was about to leave when Jimbo shouted. “You promised. If you don't give me the carrots I'll fry you up and eat you for dinner, along with the carrots.” Jimbo scowled in anger. “Huh! I'm not scared at all.” Frederick started walking away. Jimbo took one of his rocks out of the bag and tossed it at the rabbit. Frederick fell to the ground. That night Jimbo feasted on roasted rabbit with carrots and nobody in town ever found out what was in the bag.